↑ 1,0 1,1 Koonin EV, Senkevich TG, Dolja VV (2006). 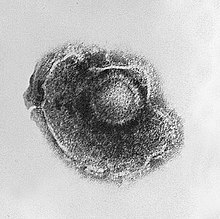 "The ancient Virus World and evolution of cells". Biol. Direct 1: 29. PMC 1594570. doi:10.1186/1745-6150-1-29. 16984643. Consultado o 1 de outubro de 2013. ↑ 2,0 2,1 Casjens S (2010). Mahy BWJ and Van Regenmortel MHV, ed. Desk Encyclopedia of General Virology. Boston: Academic Press. p. 167. ISBN 0-12-375146-2. ↑ 5,0 5,1 Breitbart M, Rohwer F (2005). "Here a virus, there a virus, everywhere the same virus?". Trends Microbiol 13 (6): 278–84. doi:10.1016/j.tim.2005.04.003. 15936660. Arquivado dende o orixinal o 04 de outubro de 2013. Consultado o 1 de outubro de 2013. ↑ 6,0 6,1 Lawrence CM, Menon S, Eilers BJ; et al. (2009). "Structural and functional studies of archaeal viruses". J. Biol. Chem. 284 (19): 12599–603. PMC 2675988. PMID 19158076. doi:10.1074/jbc.R800078200. ↑ 9,0 9,1 Rybicki, EP (1990). "The classification of organisms at the edge of life, or problems with virus systematics". S Afr J Sci 86: 182–186. ↑ 30,0 30,1 Temin HM, Baltimore D (1972). "RNA-directed DNA synthesis and RNA tumor viruses". Adv. 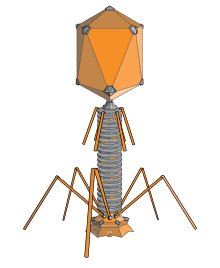 Virus Res. 17: 129–86. PMID 4348509. doi:10.1016/S0065-3527(08)60749-6. ↑ 33,0 33,1 Sanjuán R, Nebot MR, Chirico N, Mansky LM, Belshaw R (2010). "Viral mutation rates". Journal of Virology 84 (19): 9733–48. PMC 2937809. PMID 20660197. doi:10.1128/JVI.00694-10. ↑ 38,0 38,1 38,2 38,3 Mahy WJ & Van Regenmortel MHV (eds) (2009). "Desk Encyclopedia of General Virology". Oxford: Academic Press: 24. ISBN 0-12-375146-2. ↑ 46,0 46,1 La Scola B, Desnues C, Pagnier I, Robert C, Barrassi L, Fournous G, Merchat M, Suzan-Monti M, Forterre P, Koonin E, Raoult D (2008). 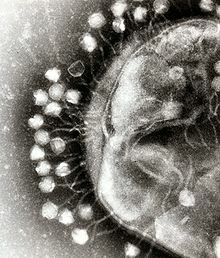 "The virophage as a unique parasite of the giant mimivirus". Nature 455 (7209): 100–4. PMID 18690211. doi:10.1038/nature07218. ↑ 49,0 49,1 Mahy WJ & Van Regenmortel MHV (eds) (2009). "Desk Encyclopedia of General Virology". Oxford: Academic Press: 28. ISBN 0-12-375146-2. ↑ 50,0 50,1 Mahy WJ & Van Regenmortel MHV (eds) (2009). "Desk Encyclopedia of General Virology". Oxford: Academic Press: 26. ISBN 0-12-375146-2. ↑ 77,0 77,1 Prangishvili D, Forterre P, Garrett RA (2006). "Viruses of the Archaea: a unifying view". Nat. Rev. Microbiol. 4 (11): 837–48. PMID 17041631. doi:10.1038/nrmicro1527. ↑ 119,0 119,1 King AMQ, Lefkowitz E, Adams MJ, Carstens EB (2011). 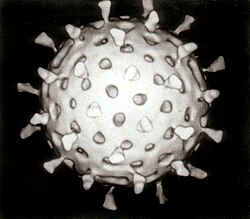 Virus Taxonomy: Ninth Report of the International Committee on Taxonomy of Viruses. Elsevier. p. 6. ISBN 0-12-384684-6. ↑ 220,0 220,1 220,2 220,3 Suttle CA (2007). "Marine viruses—major players in the global ecosystem". Nature Reviews. Microbiology 5 (10): 801–12. PMID 17853907. doi:10.1038/nrmicro1750. ↑ 235,0 235,1 235,2 Artenstein AW, Grabenstein JD (2008). 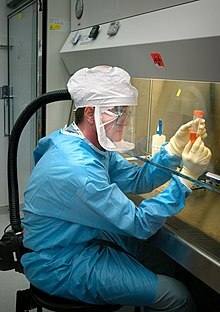 "Smallpox vaccines for biodefense: need and feasibility". Expert Review of Vaccines 7 (8): 1225–37. PMID 18844596. doi:10.1586/14760584.7.8.1225.